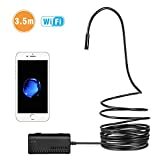 You guys absolutely love the Depstech WiFi Borescope Inspection Camera. And when we say “love,” we mean it. Thousands upon thousands of our readers have ordered this awesome wireless camera over the past few months alone, and we get tons of emails every time we cover it from people who ordered one and found all sorts of cool uses for it. If you haven’t gotten in on the action yet, don’t feel left out because it turns out you’re lucky. Why? Because it’s on sale right now for Memorial Day at its lowest price ever. Use the coupon code MEMO0001 at checkout and you’ll snag the awesome wireless that can see anywhere for just $29.99.